A week ago, I listed some cigar resolutions I had for 2014. Today I’m giving you my wish list for what I hope cigar makers will do for cigar smokers this year. One of the most impressive cigars I smoked in 2013 was the Illusione Rothchildes. You’ll probably see a review of it in the coming months. What’s impressive about it is the value it provides for barely more than $4. It’s proof that you can produce an impressive cigar for well under $5, and that for the right price cigar smokers are willing to overlook an ugly wrapper if the flavor is good and sufficiently unique. If it were up to me, I’d have my favorite ten cigar makers all compete to create their best cigar that could be sold for under $5 at retail. But I’m afraid they are more interested in creating cigars that will sell for $10 each since there’s more profit in that. A perennial plea from us is for cigar makers to disclose more information about the blends they release and for cigar brand websites to be kept up to date. Even though it can be frustrating, I get that sometimes people want to be vague about their ingredients to create some mystery, or because they don’t want their blend copied (even though I think that’s probably an overblown concern). But even more frustrating is cigar websites that don’t even have cigar lines listed that have been out for six months or more. Considering how easy it is for even a non-tech-savvy person to update a website, there’s really no excuse. Every cigar event ought to include literature about Cigar Rights of America and a list of a few easy things every individual can do to protect cigar rights. Large cigar companies spend lots of money supporting the legislative programs of CRA, IPCPR, and CAA. It would cost almost nothing to have their reps insist that if you want your free event sample cigar, you also take a little literature about how to protect your freedom to enjoy that cigar. Given that one of the more likely regulations we might see from the FDA is a restriction on free samples and events, it’s not only relatively inexpensive, but highly relevant. This is a good list. I also would love to see more info about cigars from the makers. 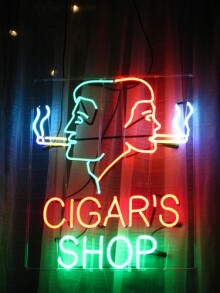 Also, I'm always looking for a good cigar around 5$. The La Palina Classic line robusto is top on my list right now.